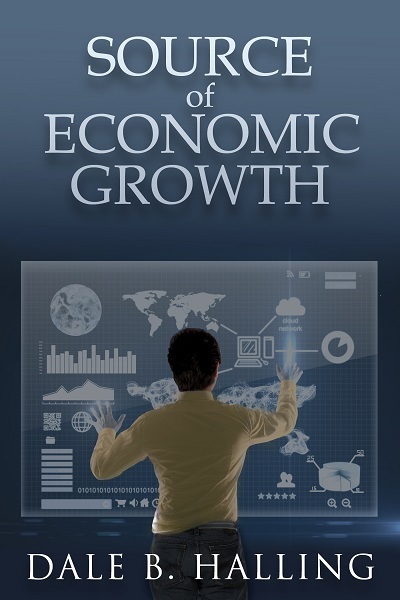 Here a couple of amazon reviews of my Book Source of Economic Growth, which examines the two most important questions in economics: 1) What is the source of real per capita economic growth, and 2) What caused the industrial revolution? The industrial revolution is important, because it is the first time any large group of people escape subsistence living (Malthusian Trap) and their incomes start to grow. By examining these questions, the book devises a science of economics that is consistent with natural rights, the founding of the United States, and is tied to the biological reality of life. Dale Halling has authored a well-written and clearly-argued treatise on the importance of “invention” in economic growth. He begins with an accurate summary of ideas from Adam Smith, John Stuart Mill, Ludwig von Mises, Joseph Schumpeter, and John Locke who are viewed as having had good ideas that were not exactly correct, and an accurate summary of ideas of Karl Marx, Thomas Malthus, and John Maynard Keyes as having had bad ideas that were completely incorrect. Then he continues with arguments that recognition and proper valuation and protection of intellectual property has been essential to economic development in various countries. The final chapter is a fictional interview with a patent lawyer from the Midwest (which he is himself) talking about the prosperous future that would occur if government behaves wisely. In that future, laws are based on reason and Wall Street and Washington power are a thing of the past. I highly recommend this book to everyone interested in the subject matter. The first book on economics that is based on sound reasoning. Economist want be viewed as scientists, but until they incorporate the sound principles of human reason like those found in this book it will forever be a “dismal science” This is a great start in the right direction. It is exciting to think of the human potential once we grasp the proper formulas and processes. Homo sapiens also consume food and create shelter to overcome the effects of entropy. Unlike other living organisms, homo sapiens organize their environment to minimize the effects of biological entropy. For instance, humans have invented agriculture to increase their supply of food (energy). Humans also harnessed the physical strength of animals, created internal combustion machines, electric lights, electricity, washing machines, tractors, computers, the internet, email, lasers, fiber optics, etc. All of these are inventions. Humans alter their environment by creating inventions. This is different from every other animal. For instance, our bison standing on coal will never be able to harness the potential energy in that coal unless the species evolves to eat the coal. The distinguishing characteristic of homo sapiens is their ability to reason. Man is a rational animal according to Aristotle’s classical definition. Man uses his reason to alter his environment (invent) and increase the energy available to him. Note that I am not limiting myself to the arcane definition of invention provided by the law. Anything that man creates to solve an objective problem is an invention. If a device/service is not found in nature separate from man then it is an invention. For example, the ability to create fire or harness it is an invention of man. No other animal has the ability to create or harness fire. Man did not have some sort of inherent knowledge of how to create or harness fire. If humans did not invent, then studying economics would be the same thing as studying the evolution of humans. While trade is also unique to humans, trade is not the fundamental basis of economics. Trade is an invention of man. If everyone produces the same thing, then there is no reason to trade. For instance, if we all produce wheat, then there is no reason or ability to trade. It is only because someone has invented a new product that trade becomes a rational choice. For instance, one group of people may have invented a process for skinning animals and using them as clothing. They may have traded this with people who had access to flint and invented a system for making simple axes. Invention has to proceed production, which has to proceed trade logically. Of course, without trade the value of invention and production is severely diminished. Biological entropy implies diminishing returns. For all species of life there is a limited supply of the resources (free energy) and conditions necessary to sustain a particular form of life at any point in time. The concentration or ease of extracting these resources varies as a result of the non-homogenous nature of the universe. A species of life thrives where it has a high concentration of resources (low biological entropy for the species) and as its population expands it has to expand to areas of low concentration of resources (high biological entropy), which results in diminishing returns. The species are then constrained by the Malthusian Trap. The way this is expressed in economics is that the use of any one resource results in diminishing returns for that resource. The question of limited human resources has been the subject of Economics since Malthus and David Ricardo. I will explore the idea of diminishing returns and its relationship to invention, by examining the idea of sustainability. Sustainability is an attempt to overcome or at least manage diminishing returns. There are numerous and conflicting definitions of what sustainability means. However, most sources point to the World Commission on Environment and Development (WCED), also known as the Brundtland Report. According to the 1987 Brundtland Report, sustainability is: “Meeting the needs of the present generation without compromising the ability of future generations to meet their needs.“ This definition is not testable and is incredibly vague. What are the “needs” of the present generation? Do we need the Internet, satellites, SUVs, etc.? How do we know if this will compromise future generations ability to meet their needs? Since this is not a productive path of inquiry, let’s take the word “sustainable” literally. A sustainable technology would be one that can be used indefinitely by humans without side effects and without any diminution in its effectiveness. This definition violates the laws of physics. According to the second law of thermodynamics, entropy always increases in a closed system. As a result, any use of technology at least produces waste heat – a side effect. Sustainability taken literally is an attempt to create a perpetual motion machine. Even the Sun’s energy will not last forever and it is not infinite. This is true whether we are talking about absolute entropy or biological entropy. Is the sustainability movement unrealistically optimistic? A key issue for the sustainability movement is the use of so called non-renewable resources, such as the use of fossil fuels and the using up of other natural resources (diminishing returns). The way this is often phrased today is Peak Oil, Peak Water, Peak _____ (Pick Your Favorite Resource). Peak Oil (natural resource) occurs when the amount of oil that can be extracted reaches its maximum or the point at which we reach the maximum net energy output from oil. The alternative definition takes into account that even if we can extract more oil, this is irrelevant if it takes more energy to extract the oil than we receive from the oil. The supposed solution for our Peak Oil problem is to develop renewable energy resources. The Clean Energy website provides the following definition “Renewable energy is natural energy which does not have a limited supply. Renewable energy can be used over and over again, and will never run out.” What is a natural energy? Either all energy is natural, comes from nature, or only animal muscle power is natural. The natural qualification is complete nonsense – unless they really want us to go back to animal muscle only. The “never run out” qualification violates entropy. All energy resources will run out. All energy sources, fossil fuels, solar, hydroelectric, tidal, biomass, hydrothermal, fission, fusion, etc are solar or at least stellar. For instance, hydroelectric energy is the result of the Sun heating the oceans or other large bodies of water. As the water evaporates and then condenses in the form of rain or snow on land masses it is collected in dams. The dams convert the gravitation force of the water into electric energy. Fossil fuels are created by plants converting sunlight into biomass (including animals). The biomass is trapped underground by sea sediment and the pressure and heat converts the biomass into oil, coal, natural gas, etc. Fission is the process whereby heavy elements, generally Uranium, are split into lighter elements and energy is released. These heavy elements were created in a star that has long since expired. Thus, all energy is Solar or at least stellar. The Sun will not last forever and does not provide unlimited energy. The concept of renewable energy that “will never run out” and “can be used over and over again” is false. So was Malthus correct? Are humans doomed by entropy to eventually return to the Malthusian Trap or worse? Is the defining characteristic of economics that diminishing returns (entropy) will always force humans back to the point that we are on the edge of starvation? If so, will evolution pass humans by and humans will become extinct? This concept of peak resources is not new. You can find numerous examples of “Peak Oil” historically. For instance, the fertilizer crisis of the 19th century. In 1830 it was discovered that bat guano was an excellent fertilizer. Population exploded, as guano was used in Europe because of the additional food (energy) produced as a result of this excellent fertilizer and mechanization. The best sources of guano began to run out fairly quickly. People predicted the equivalent of “Peak Guano.” The question was not whether we would have “Peak Guano,” but Peak Fertilizer. In other words, we did not have a guano problem we had an invention problem. The Haber-Bosch process was invented in 1909, which allowed fixing nitrogen in air and solved the “Peak Guano” problem. Reason magazine in the article Peak Everything? discussed how logical, scientific projections showed we would run out of lithium, neodymium, and phosphorus. Peak lithium was going to limit the batteries necessary for electric cars. In fact, we would run out of lithium faster than we would run out of oil. The solution is a new invention that replaces lithium with zinc air batteries. Note the solution was not a better way to extract lithium, but to make the supply of lithium irrelevant. New invention creates a paradigm shift. Peak neodymium is going to limit our ability to build the electric motors of hybrid cars as well as other products. Interestingly, neodymium magnets were invented to overcome the problem of peak cobalt. In the area of permanent magnets, it appears that a new induction motor will eliminate the need for permanent magnets. Peak phosphorus is a repeat of Peak Guano. Peak phosphorous threatens our ability to provide enough fertilizer for our agricultural needs. One solution is to expoit human waste. Phosphorous is a byproduct of human urine. The phosphorous can be recycled using a no mix toilet. The computer industry has also been beset by predictions of impending doom, when it could no longer achieve Moore’s law of doubling the number of transistors every eighteen months. Ray Kurzweil has shown that if you restate Moore’s law as computational power, every time a technology reaches its limit to improve computational power a new technology takes over. Using this he shows that computational power has been growing exponentially since 1900. The first computational devices were electromechanical. When these devices reached their limit, they were replaced with relay devices; these were replaced with vacuum tubes, then transistors, and finally integrated circuits. However, if you trace the speed of machines beginning with the invention of the steam engine, it peaks at around supersonic flight. It is hard to determine if this is an economic/technological limitation or political limitation. Diminishing returns for a given natural resource in a technology static scenario occurs because high order areas of the natural resource are exploited first. It takes more energy to extract lower order areas (high biological entropy). For instance, man first exploited gold nuggets picked up from the ground. Eventually, man dug for the gold or panned, which required more energy because it was less ordered. Note that even this change required new (additional) technologies – a shovel and pick or a tin pan. Modern techniques of gold mining, e.g., cyanide leaching, have allowed formerly unprofitable mines to be reopened. This is because the new technology allows us to exploit even lower order areas of gold. Diminishing returns only apply in a technology static environment. These diminishing returns can be modeled as a decaying exponential. Are Inventions Subject to Diminishing Returns? Every invention is a combination of known elements – you cannot create something from nothing. This follows from the natural law conservation of matter and energy. As a result, every invention opens up the possibility of more inventions by building on earlier inventions. Creating these inventions takes energy, but the number of potential inventions we can conceive of increases with every invention we create. As a result, the number of potential inventions grows factorially. There are four ways in which inventions could be subject to diminishing returns: 1) the number of inventions are limited, 2) the inventions in a narrow area of technology are limited 3) the returns on devoting more resources, as a percentage of total resources, to inventing declines, and 4) the cost of creating the next invention in any technology could increase. The number of potential inventions, however, is not subject to diminishing returns. In fact, the opposite is true. The number of potential inventions grows factorially as new inventions are created. Inventions in a narrow area of technology are subject to diminishing returns. Early inventions would appear to provide the greatest return and latter inventions appear to provide more limited returns. Ray Kurzweil has studied this and found that new technologies appear to follow an S-curve with the greatest return in the middle of the S and eventually declining in return. Cross pollination between the primary area of technology and other areas of technology appears to prevent diminishing returns in a narrow area of technology, similar to how substitute resources prevents diminishing returns for natural resources. Would it logically follow, if a greater and greater percentage of a country’s or the world’s resources were devoted to discovering inventions you would hit a point of diminishing returns? The answer is no country has ever come close to testing this hypothesis. Countries throughout history have under invested in inventions and provided little or no incentive for inventors. Those countries that have devoted the most resources to inventing, have seen the greatest economic returns. The U.S. has historically devoted the most resources to invention. It has historically had the strongest laws protecting the rights to inventions, which has resulted in greater resources being devoted to invention. England had some of the strongest laws protecting inventors at the beginning of the Industrial Revolution and it was the hotbed of invention at that time. The Italian city states of the 15th and 16th centuries had some of the first laws protecting inventors and they had a much higher standard of living. Among their inventions were modern glass making techniques and a modern banking system. There is a minimum amount of resources that must be devoted in a country to agriculture and maintenance just to keep up with the decline due to human biological entropy. If inventive activity were so large as to crowd out those activities necessary to overcome biological entropy, you would have to assume that there are diminishing returns at that point. The idea that the cost per invention could increase to the point of diminishing returns, seems to have credence if we look at a narrow technological area. For instance, the cost of improving the aerodynamics of airplanes is extraordinarily expensive. However, modern electronics allow us to improve the aerodynamics of planes by putting in control systems that allow a plane to be unstable aerodynamically. Commercial supersonic flight was not feasible economically in the 1970s because of aerodynamic drag. This problem can be solved today fairly inexpensively with electronic control systems. The cost of inventing in electronics grew tremendously with the advent of the integrated circuit. The advent of personal computers and software have driven down the cost of inventing in electronics and a wide variety of other areas. There is evidence that the cost of inventing is decreasing over time, if we do not limit inventing to a narrow area of technology. Diminishing returns can be modeled as a decaying exponential. Inventions across all areas of technology are not subject to diminishing returns. Potential inventions grow factorially, which is much faster than diminishing returns shrink. Thus, it is entirely possible to grow our technology faster than the limitations of diminishing returns. However, it is not foreordained that humans will invent. Humans are volitional beings and they can choose not to invent. There is plenty of evidence that when humans choose not to invent then they become subject to diminishing returns and their society declines or becomes extinct. For example, Jared Diamond’s book Collapse argues that many societies collapsed because of environmental problems. In a technologically stagnant society, entropy and diminishing returns will prevail and that society will become extinct. It appears that the sustainability movement is overly optimistic, in a technologically stagnant society. However, if humans choose to invent in broad technological areas, then they can escape this fate. Invention is the key to escaping the Malthusian Trap and growing real per capita income. This is consistent with Robert Solow’s paper “Technical Change and the Aggregate Production Function” paper and the subsequent work in this area of economics which shows all real increases in per capita income are due to increases in technology. It is also consistent with groundbreaking econometric studies of Jacob Schmookler, in chapter V, “Productivity Advance: A Case of Supply and Demand” of his book Invention and Economic Growth. In a technologically dynamic society, inventions will result in growth that outstrips entropy and diminishing returns. People will escape Malthusian Trap and their per capita income will grow. Some animal trade like items across time. If I have extra wheat, I give it to someone who does not have enough and they return the favor later. Usually this only occurs between family members in other species. Brundtland Commision, Wikipedia, http://en.wikipedia.org/wiki/Brundtland_Commission, 11/7/10. Mark Ridley had numerous “Peak Oil” examples in his book The Rational Optimist: How Prosperity Evolves, Harper Collins, 2010, New York, pp 121 -156. Bailey, Ronald, Reason.com, Peak Everything?, April 27, 2010, http://reason.com/archives/2010/04/27/peak-everything, 10/16/10. Kurzwiel, Ray, The Singularity is Near: When Humans Transcend Human Biology, Penguin Books, 2005, p 67. If there is a limited amount of matter and energy in the Universe, which is open to debate, there may be a limitation to the number of potential inventions. However, this limitation would be so large as to be meaningless for all practical purposes. Kurzweil, Ray, The Singularity is Near: When Humans Transcend Human Biology, Penguin Books, 2005, p 44. Diamond, Jared, Collapse: How Societies Choose to Fail or Succeed, Penguin Group,New York, 2005. Schmookler, Jacob, Inventions and Economic Growth, Harvard Press, 1966, pp 86-103. Matt Ridley in his book The Rational Optimist shows that self sufficiency is an economic dead end. Only large groups of humans can afford to have people specialize so some or all their time is devoted to inventing. Ridley, Matt, The Rational Optimist: How Prosperity Evolves,Haper Collins,New York, 2010,p. 83. Since economics is the study of how man meets his needs, the paper will first examine the nature of man. Man is like other life forms in that he is subject to laws of evolution. Evolution is the result of entropy. However, it is not absolute entropy but what is defined herein as biological entropy that controls life forms. The paper starts with an examination of biological entropy. Every species has unique features that allow it to compete in its evolutionary struggle. Homo Sapiens ’ unique feature is their ability to use their rational mind to alter their environment or invent. If humans did not invent, then the study of economics would be the study of human evolution. The defining condition of most life is that it exists in the Malthusian Trap, which is the forcing function of evolution. An important question is whether humans can escape the Malthusian Trap. The Malthusian Trap is the result of biological entropy, which implies diminishing returns. Escaping the Malthusian Trap requires humans to overcome diminishing returns. Whether humans can invent their way out of diminishing returns is explored. The paper shows that the answer to this question is that it depends. If large groups of humans invent quickly enough, then humans can permanently escape the Malthusian Trap. However, it is clear that in a technological stagnant environment, humans will eventually fall back into the Malthusian Trap. This leads to more mainstream economic questions, such as whether inventing is endogenous or exogenous? The paper shows that it is clear that inventing is endogenous. Another more mainstream economic question that is examined is whether dissemination of new technologies is inhibited by property rights in inventions? This question logically leads to the question of whether perfect competition or monopolistic competition encourages economic growth? The paper shows that incentives are not only necessary for the creation of new technologies, but for the dissemination of new technologies and that perfect competition destroys technology creation. These ideas are then applied to an understanding of the Industrial Revolution, which was the first time that large groups of humans escaped the Malthusian Trap. It is shown that the Industrial Revolution, which was really a constant invention machine, occurred because of specific incentives for ordinary people to invent. Finally, given the central role of invention to economics the paper examines whether there are any natural laws that apply to inventions. Six natural laws of invention are presented. How Does Entropy Apply to Life? Beyond The Second Law” the idea that evolution and entropy are related has been long recognized. This connection has been espoused by Jean Baptiste de Lamarck, Herbert Spencer, Ludwig Boltzmann, Alfred Lotka, and Erwin Schrödinger, in his book What is Life? However, Corning warns us about confusing energy entropy, information entropy, and physical order. Keeping this in mind, we need to define entropy in a consistent manner. As used herein entropy does not mean information entropy or physical order or strictly energy entropy, which I will call absolute entropy. Entropy means biologic entropy or the ability of an organism or a species to extract useful energy from their surroundings. While this is related to absolute entropy in that it is about extracting useful energy, what matters in biology is the organism’s ability to extract energy from its environment to sustain its life not the absolute amount of useful energy available. For instance, a buffalo (Bison) standing on a vein of coal in an open pit mine is surrounded by useful energy or low absolute entropy. However, the buffalo cannot turn the coal into useful energy for itself and if there is not any grass or sage around, it is an area of high biological entropy for a buffalo. Let’s explore this idea of biological entropy in more detail. When a bison dies it has not reached a point of maximum absolute entropy, its carcass may still provide useful energy for vultures, mountain lions, and people. Despite this, the bison’s biological entropy has reached a maximum, meaning its biological entropy has increased to a level that it no longer is alive. On an individual organism level I define maximum biological entropy as the point at which the organism dies. Many things can cause the entropy of an individual organism to reach it maximum and organisms use a variety of mechanisms to overcome biological entropy. Plants create useful energy by photosynthesis. They convert carbon dioxide into sugars (energy) using light. They use this energy to reduce their biological entropy. Animals eat plants or other animals and use the energy to reduce their biological entropy. Note that when animals eat plants or other animals, they are increasing the biological entropy of the plants and animals they eat. Thus, there are two general mechanisms that increase the biological entropy of life forms: internal and external. Internal mechanisms are those that result from the failure to consume enough calories (energy) and aging. Animals require oxygen, water, and food, in that order, to survive. Without oxygen, the animal cannot oxidize enough sugar (fat, protein) to survive – overcome biological entropy. Without water, the animal’s cells are unable to absorb energy and expel wastes. Aging is a process of increasing biological entropy. This is caused at least in part by disorder in genetic information. This genetic disorder results in the organism not being able to create enough useful energy to survive or increasing the amount of energy necessary to survive. External mechanisms include being eaten or attacked by other living organisms, diseases, accidents (for animals), and the elements. In general, living organisms use energy to overcome biological entropy first and then to increase their size. However, some animals also create simple shelters or seek shelter to ward off the biological entropy increasing effects of the elements and predators. Rain, sun, hail, snow, heat, and cold all contribute to the increase in biological entropy of living organisms. Life has two main methods of overcoming the effects of the biological entropy: 1) food (energy) consumption and 2) shelter creation (inhabitation). A species of life becomes extinct when the species as a whole reaches a certain level of biological entropy either because it cannot consume enough energy or because external mechanisms increase its biological entropy to reach the extinction level. The biological entropy level at which a species becomes extinct is the maximum biological entropy for the species. A species reaches the Malthusian Trap when increases in population of the species results in the total required energy (food) to support the population being greater than the supply of food. Most life forms exist in the Malthusian Trap, most of the time, including humans until the Industrial Revolution. In October 1838, that is, fifteen months after I had begun my systematic enquiry, I happened to read for amusement ‘Malthus on Population’, and being well prepared to appreciate the struggle for existence which everywhere goes on from long-continued observation of the habits of animals and plants, it at once struck me that under these circumstances favourable variations would tend to be preserved, and unfavourable ones to be destroyed. The results of this would be the formation of a new species. Here, then I had at last got a theory by which to work. Evolution is then a way of selecting species or variations on species that have low biological entropy and causing those species with high biological entropy to go extinct. The limited amount of food (energy) for each species ensures that evolution is a dynamic ongoing process. The variations are the result of sexual recombination of the parent’s genes and mutations in the organism’s genes. The unique feature of humans is that they alter their environment to fit their needs, they do not just rely on genetic variations that allow them to better adapt to their environment. The way humans do this is by inventing, which will discuss more in the next section. Beyond The Second Law, Journal of Bioeconomics, Journal of Bioeconomics, Vol. 4, No. 1. (1 January 2002), pp. 57-88, p. 58.